This lovely text is a translation by G Moultie of a formula (Sigesato pasa sarx broteia) in the Liturgy of S James; which may be the oldest rite still used in Christendom except, of course, for our immemorially ancient Roman Rite. I have recently been discussing the contrast between the theology of Consecration in that Rite, and that in our own Roman rite. It is indeed a splendid hymn, and the concept of the Lord's eucharistic epiphaneia is beautifully expressed. Generations of Anglican worshippers have been moved by the picture of the host of heaven spreading its vanguard before the Lord as he descends from the realms of endless day to stand on earth upon the altars of our churches. Long may its use continue. But it it is instructive to look back at the Greek original. Moultrie has done a bit of a naughty in his translation, because, instead of speaking of Christ our God to earth descending, what the Greek actually says is: 'Christ our God is going forth to be slain in sacrifice' (proerchetai sphagiasthenai). And that is language which causes problems for some people - unnecessarily. Christ did die but once for all upon the cross, as the Reformers never ceased to declare, but his one sacrifice is beyond time in God's everlasting Now. God's 'Once' is not locked into one moment in one place in History ... it is not imprisoned in 33AD. Think of it like this: God could have chosen to create nothing, but to exist in his own social, Trinal, simplicity. If He did choose to create, He could have elected to create just one moment. He could have created, for that one moment, just one place. We never think about it; but, surely, that is the most obvious, sensible, 'clean-cut', unmessy, thing to do. Yet that isn't what He did. In that tremendous eccentricity which is rooted in the very nature of the Divine Act of Creation, He created a multiplicity of times and a multiplicity of places. Within those multiplicities, He could have created just one, monic, being to exist and to be loved; but He chose instead to create a multiplicity of beings. And so it is into that complexity of times, places, beings, that His 'Once for all' is graciously communicated. The sacrifice of the Eternal Son is, in the Mass, made 'sacramentally' present on earth, in and to that plurality of the times and places which the Creator God in his fluent generosity has given to the innumerable multitudes He has created in which to worship Him and to work out their salvation. And whenever it is so made present, Christ our God does "go forth to be slain in sacrifice". 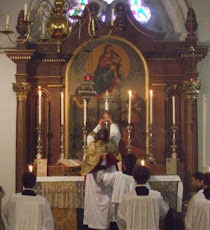 Furthermore, each Eucharist, bestowed from Eternity into Time, is not merely the offering of a monic being, but of Christ in his social body the Church, associating with him and in him those who are partaking in that new Mass in that new moment, so that the sacrifice of the Mass is ever one and unchanging and rooted in Eternity, and yet for ever here and for ever new. So I've never had any problems with that offertory prayer in the Sarum Mass, in which the priest referred to hoc sacrificium novum. But, of course, the 'Reformers' did object, and the idea of a nova mactatio has come to be regarded as one of the worst corruptions of medieval Catholicism. It is good to have the Rite of S James to remind us that this way of employing language is not only sound and wholesome but is guaranteed by the witness of East as well as of West. Throughout the Church, and throughout its history, different notions of the relation of Christ's One Sacrifice to the actual text and movement of the Liturgy have, quite harmlessly, been held. In the Greek version of the Liturgy of S James, this (Sigesato) text is used to accompany the Great Entrance; as if the Bread already is the Lord, making his way to Calvary and to Sacrifice (both Great Entrance and Sigesato are absent from the Syriac version of the rite). Theodore of Mopsuestia clearly believed that the Elements processed in by the deacons were already the dead Body of Christ, "a Body which will very shortly rise to an immortal being". As one writer has put it, "Theodore's idea is that the elements, by the mere fact that they are the offering of the church, are already the Body and Blood from the moment of the offertory". Some Oriental epicletic formulae accordingly ask that the Holy Spirit may show (not make) the Bread to be the Lord's Body. The idea that the offertory pre-consecrates can also be found among the Assyrians and the Armenians, and would appear to be implied by the custom, which I first witnessed in Oxford in the 1960s, of aged Russian Grand Duchesses, in their black dresses and weighed down with jewelry, prostrate on the ground during the Great Entrance. These Eastern instincts, in a curious sort of roundabout way, witness to the convention we have discerned in the classical Roman rite, that it is essentially the Father's acceptance of the Church's Offering which is consecratory, not the Divine Response to a Petition for the Descent of the Spirit. This series is now complete. I will now consider any comments submitted. Please attach any such comments to this final instalment. Off the point Father but have you seen the letter in the Telegraph this morning (Saturday) by a certain Rev His Honour Peter Morrell who conflates the taming of powerful interests (land owners, Trade unionists, big business) with the taming of the Catholic Church in the 16th Century? I am in the process of writing to the Editor and you may be minded to do the same. [Dix] had, as recently as 1944, devoted a fair number of pages in The Shape of the Liturgy, to explaining that the Epiclesis was not 'primitive'; and to ensuring that his readers would understand what the implications were of such an importation ,(which had first been attempted in the C of E in the abortive revised Prayer Book of 1928). O God heauenly father, which of thy tender mercie diddest geue thine only sonne Jesu Christ, to suffre death vpon the crosse for our redempcion, who made there (by his one oblacion once offered) a full, perfect, and sufficient sacrifyce, oblacion, and satysfacyon, for the sinnes of the whole worlde, and did institute, and in his holy Gospell commaund vs, to celebrate a perpetuall memory of that his precious death, vntyll his comming again: Heare vs (o merciful father) we besech thee; and with thy holy spirite and worde, vouchsafe to bl + esse and sanc + tifie these thy gyftes, and creatures of bread and wyne, that they maie be vnto vs the bodye and bloude of thy moste derely beloued sonne Jesus Christe. Who in the same nyght . . .
Brightman gives the Liturgy of St.Basil as the source for the invocation of the Holy Spirit, tho' (my Greek is not up to it) I don't think Basil invokes the 'Word'. Lord Halifax restored the 1549 rite at Hickleton before the first war. Was Cranmer 'hedging his bets' by invoking both Holy Spirit and Word? The eastern concept of the Holy Spirit at work and the western of the consecratory word of the Institution narrative and the Dominical word? Thanks again for yet another thoughtful, intellectually compact series. Much to chew on. Let us say, for the sake of my question, that there is no epiclesis (as such) in the Roman Canon (and I do agree with you that there is not). Given that, what, in your learned opinion, is the meaning of the gesture the priest makes at the Hanc igitur? Some have said it is of Jewish origin, being the gesture by which the priest places the sin of the people (world?) on to the Victim to be slain. What say you? I am struggling to understand this (due to my limited knowledge of Catholicism, liturgy, latin, theology ...), and I have a problem: how to explain "all this" to friends who are "evangelical Protestants in small congregations. Any help from one and all would be appreciated. St. Irenaeus says, in Adv. Haer, IV. 18. 6. :" Now we make offering to Him, not as though He stood in need of it, but rendering thanks for His gift, and thus sanctifying what has been created." But also, in fragment 37 he says: "And then, when we have perfected the oblation, we invoke the Holy Spirit, that He may exhibit this sacrifice, both the bread the body of Christ, and the cup the blood of Christ, in order that the receivers of these antitypes may obtain remission of sins and life eternal." So, why not say that the Divine acceptance of the gifts is the consecration by the Spirit, or that the instrument of acceptance is consecration by the Spirit? God accepted the sacrifice of Elijah by sending down fire from heaven. As st. John Chrysostom says in his book on the Priesthood III, 4.: "Picture Elijah and the vast multitude standing around him, and the sacrifice laid upon the altar of stones, and all the rest of the people hushed into a deep silence while the prophet alone offers up prayer: then the sudden rush of fire from Heaven upon the sacrifice. (...) Now ... There stands the priest, not bringing down fire from Heaven, but the Holy Spirit: and he makes prolonged supplication, not that some flame sent down from on high may consume the offerings, but that grace descending on the sacrifice may thereby enlighten the souls of all, and render them more refulgent than silver purified by fire.". It is also interesting that st. Irenaeus talks about bread and wine being the sacrifice, and st. John speaks of grace descending on the sacrifice (meaning, bread and wine), and you yourself, in your previous articles, have by reading the Roman Canon, concluded that where the Canon speaks of the oblation or sacrifice, it refers to the bread and wine, and you have equated that with the sacrifice that the Church offers and even in this article you say: "Father's acceptance of the Church's Offering which is consecratory". Same thoughts are expressed in the ancient eucharistic prayers which are quite explicit about offering creatures of bread and wine to God, and also, by st. Justin Martyr, and also many of the offertory prayers both in Rome and in the Mozarabic Rite. But now, in this article go beyond that and talk about the relationship of eternity and the present moment, and how once passed event is actually eternal and made present sacramentally (meaning of which word in this context, i have never heard explained) and offered (basically time travel). I've been struggling with understanding what the Church actually teaches about this for about a year now. The Eucharistic Prayers (save the 3rd and 4th one from the Roman Missal) have the lex orandi which points to the lex credendi of the bread and wine being the Sacrifice in the Eucharist. But there are several aspects of the (by the Council of Trent) dogmatized lex credendi: in the Mass, the sacrifice is Christ's very, real, substantial, sacramental Body and Blood offered. Moreover, because of the concomitance, it is Jesus himself that is offered, and moreover, it is the making present and the sacramental offering of his unique sacrifice. So, is there a disparity? Do we understand oblation, offering and sacrifice to refer to different things and thus solve the disparity if there is one? But then again, the offertory prayer you cited in one of the previous articles says "accipe sacrificium... et sanctifica". One more thing, you mention the belief that the offerings are by the mere usage in the Eucharist, already made Body and Blood. That same idea is echoed in st. Serapion's EP, in the EP which st. Ambrose cites, in which the Quam oblationem equivalent has not the prayer to bless and rationalize the elements in order that they become the Body and Blood, but to bless that quod est already fiugra. Also, the Mozarabic Liber Ordinum has "imago et similitudo" in that same place. So it seams that this kind of belief was quite spread out. First, in response to Marko Ivančičević, the Irenaeus Fragment 37 is an 18th-Cetury forgery' cf. Second, in response to John F H H, I would commend to him two articles by the late Rev'd Dr. Edward Craddock Ratcliff (1896-1967), Regius Professor of Divinity at Cambridge from 1958 to 1964: (1) "The English Usage of Eucharistic Consecration 1548-1662," published originally in Theology vol. 60, no. 444 (June 1957), pp. 229-236; no. 445 (July 1957), pp. 273-280, and later reprinted in E. C. Ratcliff, Liturgical Studies ed. A. H. Couratin and D. H. Tripp (London, 1976: SPCK) and, more importantly, (2) "The Liturgical Work of Archbishop Cranmer," published originally in Journal of Ecclesiastical History , vol. 8, no. 2 (October 1956), pp. 189-203, and reprinted in Liturgical Stuidies ed. Couratin and Tripp. In the latter, not only does Ratcliff controvert Brightman's view that the Liturgy of St.Basil was the source for the invocation of the Holy Spirit, but points out that Brightman himself later retracted that view, coming to the view (which Ratcliff shares) that Cranmer's clause owed nothing to St. Basil, but was simply an expression of traditional Western teaching about the mode of eucharistic consecration. Ratcliff goes on to cite a passage in the Sarum Breviary's Mattins of Sunday in the Octave of Corpus Christi, according to which (in a phrase going back to Paschasius Radbertus) consecration in verbo efficitur Creatoris et in virtute Spiritus Sancti ; nor does the shape of Cranmer's petition resemble that of an Eastern epiclesis. Thank you, professor Tighe, for your elucidating comment. I shall see if I can get hold of Ratcliff's Liturgical Studies. Just two thoughts on a typically learned and informative series. The second comment is to suggest a distinction between the words of the rite and the theological understanding of it. I have in mind especially Gregory VII's Lenten Synod of 1079, in which he promulgated his condemnation of the teaching of Berengar of Tours that the presence of Christ in the consecrated species was merely symbolic. In condemning that view, Gregory and the synod laid out the correct understanding of Catholic teaching which included the phrase 'the Holy Spirit assisting' when it spoke of the consecration. That is one instance, admittedly (I came across it some time back when browsing the translation by HEJ Cowdrey - another fine Anglican scholar - of Gregory's register), and I shall leave it to others more expert than I to parse its status as a magisterial act. But a magisterial act it surely is, and, significantly, from the period after East and West had separated. The Roman Canon admittedly does not mention the Holy Spirit, and I think you are right in your characterising of the primary theology of the Roman canon. But perhaps we should be careful about saying that the Holy Spirit has no part in Roman theology of the consecration. After all, St Paul would remind us that all prayer and supplication is the Spirit praying within us. I'm sorry: I'm not in the business of looking for an epiclesis in the Classical Roman Rite because it hasn't got one and never had one and its theology excludes one. That was really the whole point of my writing this series!!!!! Veni Sanctificator is not a part of the Church's formal liturgy. It is one of the private devotions of the priest and, I think, does not appear in the Dominican version of the Roman Rite. Jungmann says that it shows up first in ninth century Ireland and took a long time to catch on in Rome. ...ad Deum qui laetificat iuventutem meam! !